From the Ramada Davenport Orlando South it takes just 30 minutes to reach most of Orlando’s top attractions. You can load the family into the car and cruise to Walt Disney World® Theme Parks, Legoland, and Universal Studios Orlando. Back at the hotel, you can close out the day by taking a dip in the outdoor pool or relaxing beneath a colorful umbrella on the sun deck. Where you’ll stay: The newly renovated guest rooms are based on double occupancy and feature free WiFi, microwaves, fridges, flat-screen HDTVs, and coffeemakers. Start the day with a free continental breakfast at the onsite restaurant. Grab a bite: Unwind with drinks at the onsite bar or at one of many restaurants within walking distance, including Bob Evans, Sake Sushi, and Dennys. Located in the center of Florida, Orlando may be forever associated with the Walt Disney World® Theme Parks—the world’s most-visited entertainment resort. Spanning roughly 30,000 acres, it encompasses four theme parks, two water parks, five golf courses, and the Disney Springs® Area. There’s no shortage of things to do here: begin your day by boarding a rocket-shaped three-seater that climbs to 180 feet before entering a deep black tunnel and racing past stars, satellites, and constellations. Walk across the park to sample Moroccan cuisine for lunch, or ride a dune buggy through a haunted mansion. Before heading back to the hotel, take in the nightly fireworks, laser, and water show. 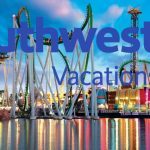 One of the most popular family destinations in the world, sunny Orlando is also home to Universal Orlando—which includes The Wizarding World of Harry Potter—SeaWorld, and Gatorland. Those hoping to shake up the typical theme-park-dominated itinerary can head into downtown Orlando’s vibrant arts district. The neighborhood boasts venues such as CityArts Factory, a multifaceted patchwork of gallery spaces, and SAK Comedy Lab, which hosts family-friendly improv shows five nights a week.